HomeNO ALCOHOL SERVED TODAY – WHY? Tuesday 27th October 2015, Pavarna, is an important Buddha day in Thailand as it marks the end or the Vassa, also known as the “Rain Retreat” and sometimes is called the Buddhist “Lent”. Vassa is a 3 month retreat for practicing monks and those seeking enlightenment that began with the very first Buddhist monks in India over 2,500 years ago. They would spend the Indian Monsoon season together, away from the distractions of life. At the end of Vassa it is time for Kathina, an ancient robe offering ceremony. This all began before there were any monasteries and there were “wandering teachers” with a groups of disciples that followed them, much like the life that Buddha lived. These Gurus would attract a following of men searching for enlightenment and usually lived in the forest under simply constructed shelters made from the trees. History tells us that Buddha began his spiritual journey by seeking audience with highly regarded Gurus of his day. When Buddha attained enlightenment, disciples began to follow him. They wore simple clothes dyed with turmeric or saffron, this is why the monks and gurus robes now have the distinctive yellow-orange colour. There are ten original precepts followed by ancient monks, which are similar to the Ten Commandments in the Bible. To be a novice or practicing monk, a man must follow The Cardinal Precepts. Precept No. 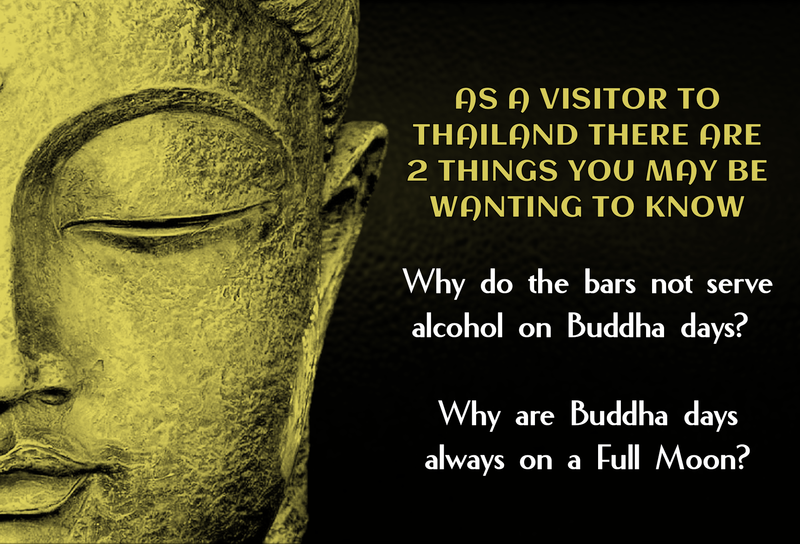 5 No taking of intoxicants, is why there is no consumption of alcohol permitted if you are a practicing Buddhist, as Thailand is predominantly a Buddhist country, over 90% of the population is Buddhist, bars are not permitted by law to sell alcohol on Buddha days. All Buddha days or extended Buddha festivals revolve around the Full Moon because it is written that Buddha was born on a Full Moon in the month of May. It is also written that he became enlightened on this day and finally passed on this day, which is known as Vesak and celebrated worldwide. I’ve always wondered why and here you go..